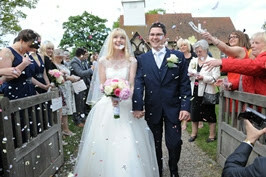 For many years young couples have enjoyed making their marriage promises to one another within their local church at Hawkwell. God ,our Creator has given marriage within His overall purpose for Humanity, so people of all degrees of belief are welcome to marry in their parish church. What begins as an inquiry can develop into as much a you want to say to God, in thanksgiving for the love you have found, and to want to know more of Him, - all of which is meant by 'We want His Blessing on our marriage'. A wedding in church benefits from history and content as well as atmosphere and celebration. The nationally used Common Worship Service is a modern ceremony retaining the format and rich meaning in which, for centuries, couples have come to make their wedding promises to one another; in the presence of your family and friends, and seeking God’s blessing. The 45 minutes of a Church wedding ensure that we have time for an unfolding programme, in which first explanation then your promises, with your choice of hymns,and then later prayers all combine to provide the couple with support and understanding as you step into your marriage. The Rector and his team will have prepared the couple through a group wedding seminar, and with a personal rehearsal in church on the Thursday evening before your Saturday wedding. We trust that our staff share the joy & happiness of you and your family on the day, in a way that will truly benefit you and help form your happiest of memories. St Mary's is a medieval church building in its atmospheric rural setting on Rectory Rd. This 100 seater church is both intimate and light & bright. Moreover, it is carpeted and has modern - chair seating too. All of which contributes to the wider experience of your Special Day. One or both of a couple must be resident in the parish, be a worshiping member of the parish or have a qualifying connection with the parish. For a full list of roads in the parish see below. If one or both of you has been married before and divorced then you will be invited to meet with the Rector first. Banns are the public announcement in church of your intention to marry and the opportunity for anyone to speak up if they know a reason why this would not be legal. It is a legal requirement for banns to be read 3 times in the parish where each party lives as well as the parish in which the wedding is to take place during the 3 months preceding the wedding. In certain circumstances you will need to be married under Common Licence. The Wedding Team will explain this procedure if it applies to you. Fees are made up of two parts; those set by the diocese and those set by the local church and these are readjusted each January. The fees for a wedding in Hawkwell in 2018 are £735.00. This includes the use of the church incl heating and lighting, the reading of banns in this parish, minister, organist, verger, car-park attendant, wedding certificate,service sheets, registers and other admin. 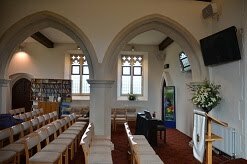 1.If you would like to have your ceremony video recorded then there is an extra fee of £33.00 for permission to video in the church. 2.If you need to have banns read in another parish then there will be a fee of £43.00 to that parish. 3. If you have a video made of your wedding you may need to purchase a Limited Manufacture Licence to cover copyright -see below for further explanation. If you are interested in booking a wedding at Hawkwell please contact the church office 01702 543514 to make an appointment. At that meeting we will agree a date and time, usually a Saturday, suitable to you and to the Church and the minister. It is important to agree this with us before you book your reception. Couples usually find out available dates for their reception and come with some options. Sometimes it is possible to make a provisional booking which can be confirmed or changed once you have booked the wedding. You will be asked to bring proof of your identity and address, and qualifying link where appropriate, fill out a form and pay the deposit to book your date. We will then explain the procedures, discuss all the details and answer any questions that you have. About 3 months before your wedding we will arrange to see you again to book the dates that your banns will be read, pay the balance of the fees, choose your hymns and music, and finalize any other details. Rev'd Nick Rowan will officiate at all weddings in the parish. You will meet him on your Marriage Preparation Day and at the rehearsal. Marriage is a very important step in your lives and, therefore, we are required to provide Marriage Preparation for couples being married in Church and you will be asked to attend when you book your wedding. This is usually held on a Saturday in March and takes the form of videos, talks and discussion with plenty of refreshments. A wide range of topics are covered from budgeting, listening and communication skills to the meaning of the vows that you will make to each other. The rehearsal is usually held on the Thursday evening before your wedding day. The bride, groom, best man, bridesmaids and whoever is giving the bride away should attend.The clergy person will take you though the service and also use the opportunity to get to know a bit about you and let you get to know him. You should bring your video licence and Banns Certificate as appropriate. Emmanuel is larger with a very modern 200 seater interior. It is especially light and spacious, with its amazing handcrafted 3-D tapestry Cross. It is also carpeted with modern - chair seating and has a crèche facility adjoining the church area. Parent has lived in the parish for at least 6 months during your lifetime. Parent has regularly attended worship in the parish for at least 6 months during your lifetime. If you are being married elsewhere but need your banns to be read in Hawkwell please contact the Wedding Team. They will make an appointment on a Mon evening for you to fill out a form and pay the £43.00 fee. You need to bring proof of Identification, preferably a passport and proof of your address. You should hear your banns read at least once as it is your responsibility to ensure that they are read properly. You can collect your Certificate on the Sunday after the 3rd reading. Flowers are the responsibility of the couple being married. However, many couples are happy to have the flowers that are normally put in church each Sunday and for this there is no charge. Otherwise you are quite welcome to provide your own flowers. St Mary's is a small church,therefore, the total number of bridesmaids, page boys and flower girls does need to be limited to a maximum of 5. Two ushers are sufficient to assist the vergers in seating your guests. 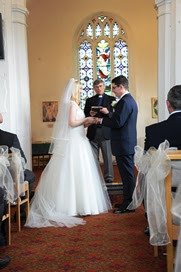 The church provides duplicated, personalised orders of service including the words of the wedding service and your hymns. Photographs may be taken outside and inside the church before and after the service. However, only one designated person, professional or friend/family may take photos without flash during the service. The Rector will explain where in the church and at what point in the service this is appropriate. You may arrange to make a video recording of your service. One static video camera may positioned with the agreement of the Rector in a place where it will not interfere with the ceremony. Whenever music is recorded copyright permission is required; you may need to purchase a Limited Manufacture Licence. Please click here for further information. At St Mary's there is one bell which we will be pleased to ring as you leave the church. All confetti must be biodegradable and must not be thrown on Church property. There is parking along the right hand side of the road opposite St Mary's Church with the kind permission of the farmer. We provide a car parking attendant at weddings to ensure that cars are parked safely and access for farm vehicles is maintained at all times. There is a small car park behind Emmanuel Church which is available to the wedding party, otherwise parking is on the local side streets.